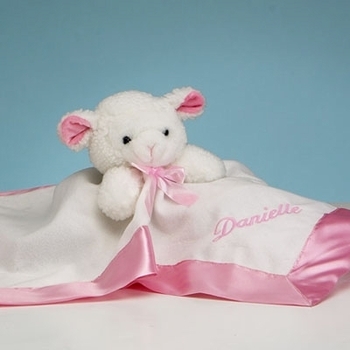 This beautiful and cuddly lamb security blanket set features the baby’s name professionally embroidered on the blanket. It is made of downy fleece fabric, edged in delicately soft pink satin. Also includes the plush lamb toy for her to hold while she naps. The blanket measures 23” x 17”. Gift wrapping of this unique gift is also included! The new parents of the twins thought these blankets were just adorable! So cute! ProsSo easy to order and loved that you have free personalization!